The Diary of a Nouveau Soccer Mom: My baby is 4! On Saturday, August 8th, the boy turned 4!!! Ben was so excited for his birthday this year. 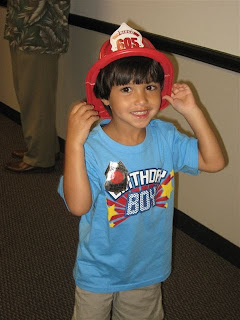 He had his party at the local firestation and had his own list of friends to invite (there are several little ones who are all in church classes together and they were able to come celebrate with him). He had an awesome fire engine cake, then we came home and had a fun afternoon before dinner and cake at Olive Garden. We got him the Imaginext Space Station and a couple of aliens (Miss Barb & Mr. Larry got him the other 4 pieces), a Cars game, a Diego Lego set, a book, and his very desired "garbage truck with a lifter on the *front*. Faith got him to Imaginext Monkey Mountain add-0ns (gorillas and lions), my parents got him a Ben-sized pirate ship, Cars legos, and a Scooby Doo movie. He got two sets of Playmobil pirates from Uncle Scott & Auntie Denise and a HotWheels Shark racing set plus cars from Aunt Carolyn & Uncle Bill. Plus, he got many sweet gifts from his friends. All in all, a good day for the boy, can't wait till my living room stops looking like it exploded! We went their a couple of weeks ago!! It was our first time ever and we loved it! We didn't do the spy exhibit...my kids are still a bit too young for that but we loved the children's museum.